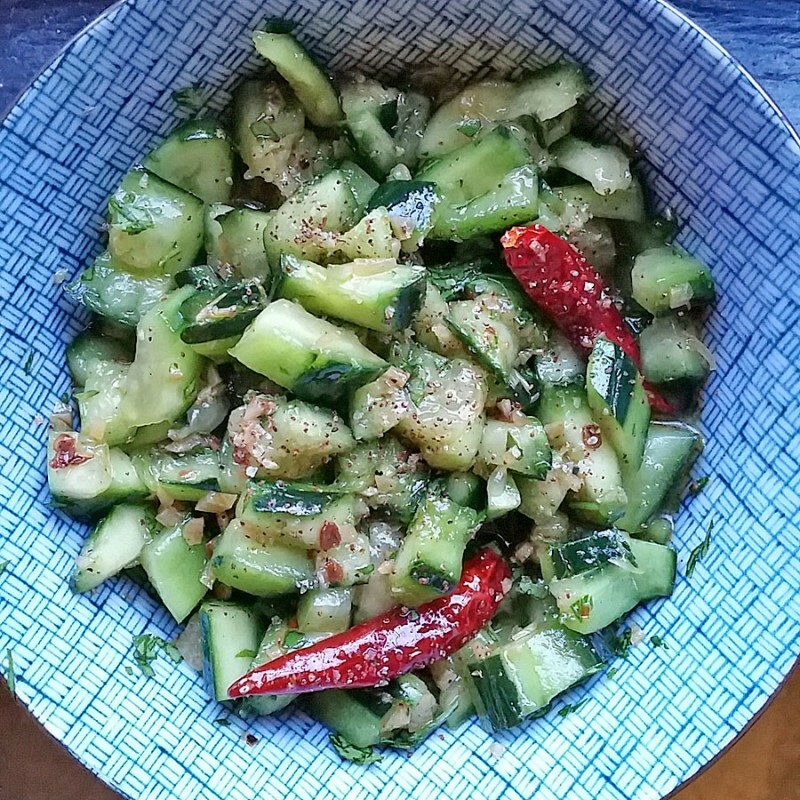 A spicy Sichuan peppercorn flavored cucumber salad where you smash the cucumber so it absorbs more of the dressing. Smash the cucumber by laying it on a cutting board and trimming off the ends. Take a chef’s knife or a cleaver and smash it on the cucumber sideways so the cucumber cracks. Do this for the entire length of the cucumber, then slice it into 1/2” chunks. Salt the garlic by mixing it with 1/2 teaspoon salt and sitting it on a piece of paper towel to drain off excess liquid for 10 minutes. In a small skillet, heat the peanut oil and sauté the garlic and chilies, stirring constantly until garlic turns gold, about 1 minute. Remove from heat, add sesame oil and cool. In a medium bowl, mix the rice wine vinegar with the sugar until the sugar is dissolved, then add the cooled garlic mixture, the cucumbers and the remaining ingredients. Feel free to add more Sichuan peppercorn salt to the cucumber salad if you’d like more of the numbing flavor. I added peanuts because I love them.